The Lens serves global patent and scholarly knowledge as a public good to inform science and technology-enabled problem solving. With us, everyone gets the best we have at no cost. We don't do 'Freemium'. Everybody uses Lens for free. We think the ability for anyone to create new value should not be constrained by access to critical knowledge. Our data is open, global and can be accessed, used and shared by anyone. We don't discriminate by who you are or where you are; we aspire to help problem solvers in any jurisdiction and any language. Privacy matters...your Lens use is your business and yours alone. We don't share or sell any knowledge of your use of The Lens. We don't use Google Analytics or other cloud based click-trackers to 'optimize' your experience. We don't keep track of what you do (unless you ask us to). We don't advertise or let others advertise on Lens. We avoid any third party software that could expose your use to others. 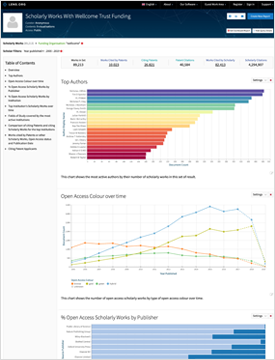 We have been working on a range of new visualisations and charts to explore and analyse scholarly works.